Sports – Page 977 – Welcome to Wyandotte Daily! On Tuesday, July 8, the Kansas City T-Bones will help raise awareness for domestic violence with Strike Out Domestic Violence Night from Verizon Wireless. Fans are encouraged to bring and donate their no-longer used phones and accessories, in any condition from any wireless provider at the 7:05 p.m. game at the CommunityAmerica Ballpark in Kansas City, Kan. Verizon will then donate all collected devices to Kansas City-area shelters for victims in need. There will be a silent auction benefiting Safehome domestic violence shelter. In addition, Verizon Wireless will be giving away T-Bones cell phone cases to the first 1,500 fans that arrive. During the game, live tweeting from the Social Media Club of Kansas City will also take place to continue to raise awareness. Fans are encouraged to join the conversation on social media by using the hashtag #StrikeOutDV. Vice president-general manager Chris Browne, select T-Bones players and T-Bones media personnel will conduct live tweet sessions before and during the game via @tbonesbaseball. A Champions League soccer match will be coming to Sporting Park in Kansas City, Kan., in September. CONCACAF has announced the dates and times for the 2014-15 CONCACAF Champions League group stage. Sporting Kansas City is paired with Nicaraguan club Real Esteli and Costa Rican club Deportivo Saprissa in Group 2. For the second consecutive year, Sporting Kansas City will open the tournament on the road, playing Real Esteli at 9 p.m. CT Tuesday, Aug. 19. Sporting KC defeated Real Esteli 2-0 in their CCL opener in August 2013 and drew Esteli a month later 1-1 at Sporting Park. Following Sporting KC’s road opener against Real Esteli, the defending MLS Cup champions will return home for back-to-back matches at Sporting Park in Kansas City, Kan. Sporting Kansas City will play host to Saprissa on Thursday, Sept. 18, and Esteli on Tuesday, Sept. 23. Both matches will kick off at 7 p.m.
Tickets for both group stage home matches are included in season ticket member packages. Tickets will go on sale to the public at a later date. Sporting Kansas City will conclude the group stage of the tournament on Thursday, Oct. 23, against Saprissa at Estadio Ricardo Saprissa Ayma. Saprissa won the 2014 Clausura in Costa Rica and are three-time CONCACAF Champions’ Cup winners. The team with the most points at the conclusion of the CCL group stage will advance to the quarterfinal round. Sporting Kansas City advanced to the quarterfinals of last year’s tournament, finishing first in a group that included Real Esteli and Honduran club CD Olimpia. Sporting KC faced Mexican club Cruz Azul in the quarterfinals in March and lost 5-2 on aggregate. Six-year-old Brody Cook has done it again. For the second straight year, the young dirt bike racer from Kansas City, Kan., has qualified for the largest amateur motocross race in the world, the 33rd Annual Rocky Mountain ATVMC AMA Amateur National Motocross Championships presented by AMSOIL at Loretta Lynn’s Ranch in Hurricane Mills, Tenn.
Cook took on more than 20,000 hopefuls from across America to earn one of just 1,446 qualifying positions. “To make it as a 5-year-old is a rarity so it is very unusual for someone to make it two years in a row,” said Cook’s father, Josh. A wreck in the first race of the preliminaries cost Cook any chance of advancing to last year’s finals but he’s hoping last year’s experience will help him this year. Cook, who will be in second grade at Glenwood Ridge Elementary in Basehor this fall, has been riding since he was 4 years old. 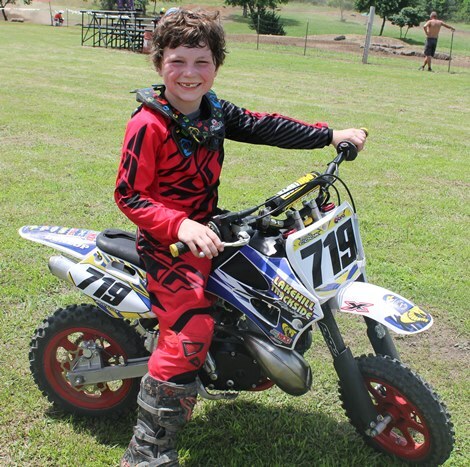 Winner of several races in the last two years, he’s competed in eight states – Michigan, Ohio, Texas, Oklahoma, Nebraska, Illinois, Missouri and Kansas – this year and is entered in a four-day national championship event in Ponca City, Okla., the week prior to the AMA championships. The AMA national championships will held in Hurricane Mills July 27-Aug. 2. He’ll be accompanied by his parents, Josh and Mindy Cook; his younger brother, Jack; and his great-grandparents, Bob and Sylvia Hartman. More than 20,000 bikers competed over the last four months in qualifying for the national championships with the top finishers in area and regional qualifiers earning a berth into the National Championship race. Racers may enter a wide variety of classes, from mini-cycle classes for children as young as four, all the way up to a senior division for riders over 50. There are also classes for women and classes for both stock and modified bikes. Most of America’s top professional motocrossers, including James Stewart, Ricky Carmichael, Travis Pastrana and Jeremy McGrath, have won AMA Amateur National Championships at Loretta Lynn’s. The race is so prestigious that in 2012 it became part of the Red Bull Signature Series, airing race coverage on NBC for the first time ever. In 2013, the coverage of the Red Bull Signature Series was broadcast live on NBC for the first time ever. In 2014, the racing will be streamed live on-line all week long on RacerTV.com. The track is built on a section of Loretta Lynn’s Ranch and Campground in Hurricane Mills. The course contains a variety of jumps, corners and other obstacles designed to test the skills and stamina of the racers. Most riders attend the event with the help of their families. In fact, many groups consider the event their family’s summer vacation. Besides races, the ranch provides family-friendly facilities including a game room, swimming pools, arts and crafts activities as well as a fashion and talent show.